How Kotlin Makes Coding Easy For Android Developers? 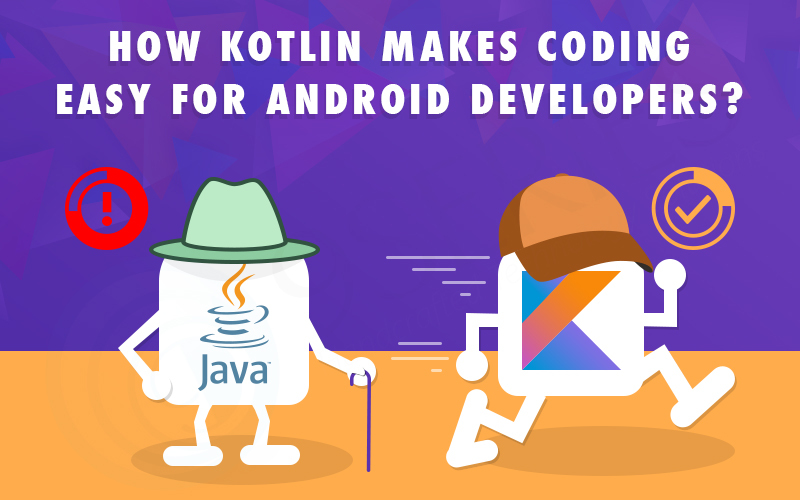 Kotlin is now an officially supported language in Android which is developed by JetBrains. It’s expressive and powerful. It is like a boon for the Android developers. With Kotlin you can do Android development, front End, server development, and can also write Gradle script. Java developers can understand most of the codes without ever having written a line of Kotlin, So Java developers can easily accept Kotlin. It’s an easily removable nullpointerException. Kotlin contains less code than java hence chances for code failure are very less, and therefore it becomes more stable. Kotlin code is easier to understand when someone else reads it and, again, it’s more difficult to introduce errors. It helps developers to make their app developing process faster. In Kotlin 20% less coding is needed compared to Java. It is a very simple language as compared to Java and easy for freshers to learn and use. It is accessible with an intuitive syntax that enables developers to learn quickly. The best advantage of Kotlin is you can add Kotlin class in your project even if your project is developed in java. All the libraries that are working for the Android project are supported by Kotlin so don’t worry to use third party libraries in your Kotlin project. It enables the developers to use the Java frameworks in their new Kotlin projects by using latest frameworks without the need of changing the whole project in Java. Kotlin supports open developer networks and the depth of open source makes the network strong which however is not restricted to any single company. Kotlin Android programming language App development has been made available for free. You don’t need to worry about the costing or charges here. Ex: here? sign check that object is null or not. if it is null than compiler does not allow to run that particular sequence. Most useful things of Kotlin is lambda expressions. Ex. for how to define setOnClickListener in Lambda expression. Here we define some of the most useful lambda functions in development so you can easily use that functions and reduce your line of code for better App performance. Here it is autogenerated parameter which we don’t specify. Any function is working like or condition in java. It returns true if only one element satisfies the condition.